Until now, any data you scraped — either via the Grepsr for Chrome extension, or our Concierge platform — would remain within the Grepsr app and thereby Grepsr servers unless you’d delete your project or report manually. Most projects contain reports that were useful at the time but are no longer required. Such reports accumulate over time and hog the server’s memory, thus reducing its efficiency, causing subsequent new crawl runs to slow down. A change in our data retention policy means that your data will no longer continue to stay in our servers indefinitely. Your data will be retained in the Grepsr database for 90 days from the crawl date, i.e. visible in the report’s Data Preview tab. For our inactive customers, the data will be completely removed after this period. 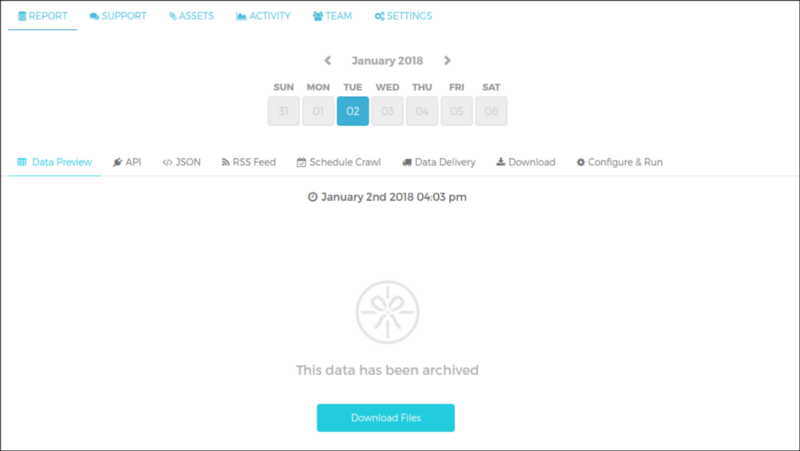 After 90 days, the data will be archived as a CSV file, which can be easily downloaded for up to TWO years via the Download files button on the same Data Preview tab. After two years, the data (including the CSV file) will be completely removed. If you think you still might need it beyond the two years, we request you to download and keep a copy safe for the future.